I and a friend hunted Green Lake Outfitters for whitetail for the first time in November of 2010 and both of us connected on great bucks the 4th day of our hunt, Thanksgiving Day (US). We each shot heavy mainframe 5x5s with some extra points and character scoring 154 and 175 B&C, see the last two photos in the website gallery. Seven of us went back the next spring for black bear and some good fishing. For that hunt, I had a top-notch guide that lives in that area and grew up in the bush. Both of these hunts were all I had hoped for and anticipated. Trevor Vause runs a well organized camp and is a great cook, outfitter and guide. The most important thing: he works super hard to produce for his hunters. I’ll be back soon, joined by a few others who have a passion for taking big deer or black bear. I’ve made three trips to Green Lake Outfitters with Trevor Vause and each trip was better than the last. Tagged game on every trip so far. I’m booked for my fourth trip in a row in November 2011 for deer again. The price cant be beat, and you see quality game every day in the field. I don’t think these deer have ever seen people up here. The camp is way out in the bush. No phone, internet or Jacuzzi. Just excellent hunting and good conversations with the guys in camp at the end of the day. You’ll enjoy a hot, home cooked meal each morning and every evening after a day of hunting. I think I gained a couple pounds during the week. 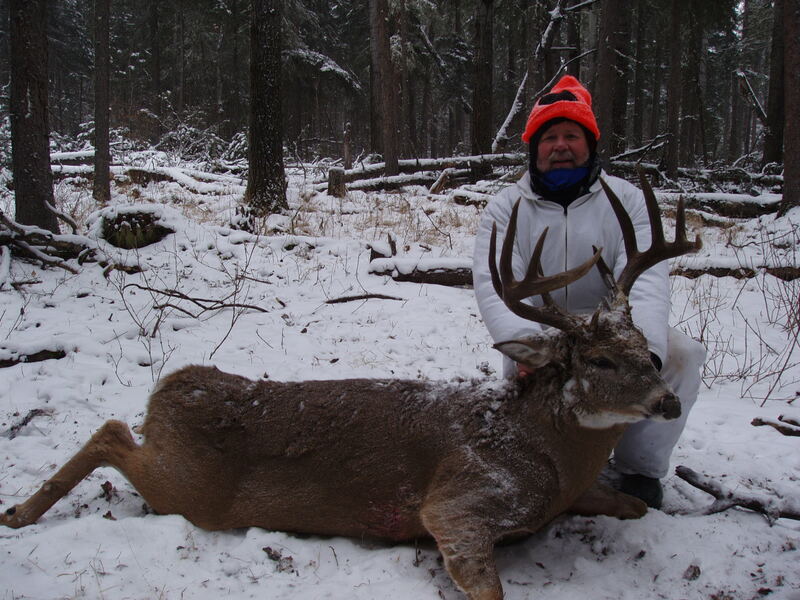 Book a hunt with Trevor of Green Lake Outfitters and it wont be your last.